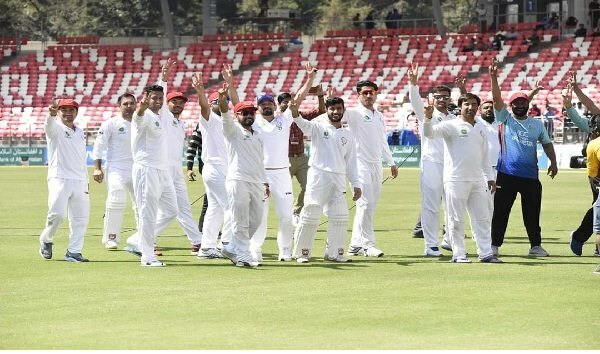 Dehradun: Afghanistan registered their first-ever Test victory as they defeated Ireland by seven wickets in the one-off Test, here on Monday.On day fourth, Afghanistan resumed their innings on 29/1, with Ihsanullah and Rahmat Shah on the crease. They needed 118 runs more to win the Test. From Afghanistan, Shah played unbeaten 65 runs knock in second innings. He also scored 98 runs in first innings. He got good support from Ihsanullah, who chipped in with the bat with 65* runs innings. Chasing a paltry total of 147 runs, Afghanistan got off to a bad start as they lost Mohammad Shahzad for 2 runs. Then, Ihsanullah and Rahmat Shah stitched together 139 runs partnership for the second wicket, helping Afghanistan to win the Test. Earlier, leg-spinner Rashid Khan (82/5) helped Afghanistan to bowl out Ireland for 288 runs in their second inning. From Ireland, Andrew Balbirnie (82) and Kevin O'Brien (56) were the high scorers.